Setting up the Linksys Smart Wi-Fi Router is made easy using the Smart Setup Wizard using a compatible web browser. The Smart Setup Wizard is embedded in the firmware and is available even if the router does not have an internet connection or is in its default settings. This article will guide you on how to set up your Linksys Smart Wi-Fi Router using the Smart Setup Wizard. 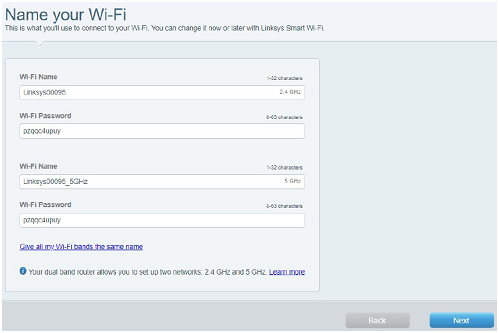 QUICK TIP: The Smart Setup Wizard is supported by all Linksys Smart Wi-Fi Routers. You do not need a setup cd or additional software to set up the router. 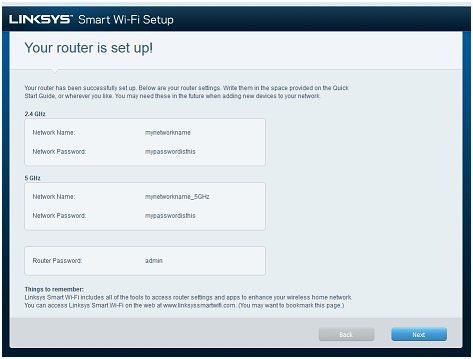 You have the option to directly access the router’s web-based setup page while going through the setup process. NOTE: The CD included in the packaging does not contain any setup software. It only contains your router’s documentation. I don’t have a modem. Are there any other alternatives? Yes. What you can do is to connect the cable (also called a patch or a fiber optic cable) provided by your Internet Service Provider (ISP) directly to the computer’s ethernet port. If your internet access is working, you can begin by following the steps below. If your router came with external antennas, connect the antennas to the router first and then plug in the router to a power source. If your router has a power switch, make sure that the power switch is set to the | (ON) position. Wait until the power light indicator is solid. Connect the ethernet cable from your modem to the Internet port of the router. Connect to your secured Wi-Fi. You can locate the Wi-Fi credentials either at the bottom of the router or on the Quick Start Guide. To prevent any problems during setup, make sure you have a good signal from the router by bringing the computer closer to it or moving the computer in the same room as the router. NOTE: If you are using a wired computer, skip Step 3 and proceed to Step 4. Launch your web browser and enter "http://linksyssmartwifi.com" in the Address bar then press [Enter]. QUICK TIP: If you are unable to launch the Smart Setup, you can enter the default IP address of the router, 192.168.1.1, or type myrouter.local in the browser's Address bar. Tick the checkbox beside I have read and accepted the License Terms for using this software then click Next to proceed. If you prefer to manually set up the router and bypass the Smart Setup Wizard, click on the Manual configuration link at the bottom. 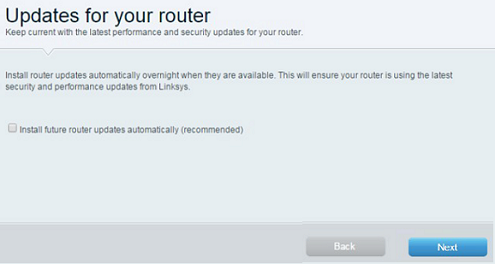 On some Linksys Smart Wi-Fi Routers you will see a checkbox I want to skip Setup and configure my router manually. Tick this option and click Next. If the Smart Setup screen does not show up, press the Reset button at the back of the router for 10 seconds, turn the router OFF and then turn it back ON. Wait a few seconds for the router to boot up and start at Step 1 again. 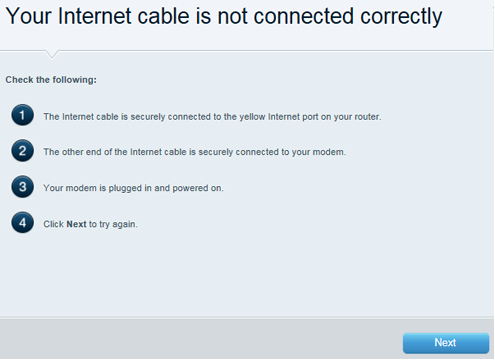 If no internet connection is detected, the Your Internet cable is not connected correctly window will appear. Follow the suggested troubleshooting steps on the screen to resolve your connection problem then click Next. For Digital Subscriber Line (DSL) users, the setup will prompt for the Point-to-Point Protocol over Ethernet (PPPoE) Account name and Password. Enter the necessary information then click Next to continue. In the Updates for your router window, the Install future router updates automatically (recommended) is checked by default to allow automatic updates. You can uncheck it to control when to perform an Auto-Update. 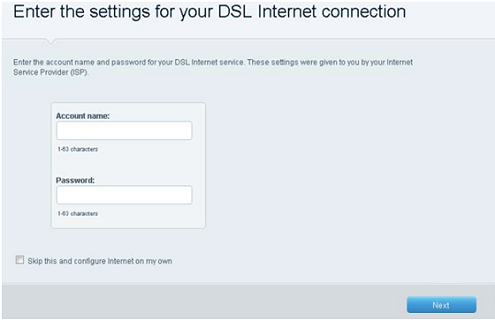 You can also enable this option again after you log into the router's web-based setup page. Click Next to proceed. Enter your desired Wi-Fi Name and Wi-Fi Password in the fields provided, and then click Next. Unlike the 2.4 GHz Wi-Fi Name, the 5 GHz Wi-Fi Name will be appended with the _5GHz suffix. NOTE: If you want to use a singular name for both network bands, select Give all my Wi-Fi bands the same name. Connect to the new Wi-Fi Name then return to setup and click Next. 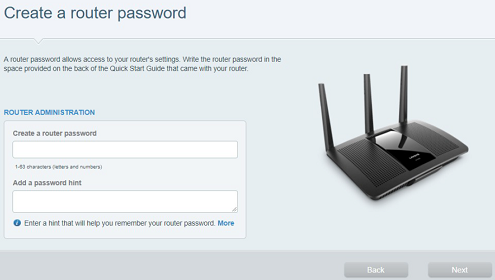 Enter a router password in the Create a router password field then click Next. QUICK TIP: If your router displays an Add a password hint option, enter your preferred hint in the field. This will help you remember your router password in the future. If you see the Your router is set up! message, this means that your router is now successfully set up. The new Wi-Fi settings as well as the router admin password will be displayed. Make sure to write down the new settings on the Quick Start Guide for future reference. Click Next to complete the entire setup. 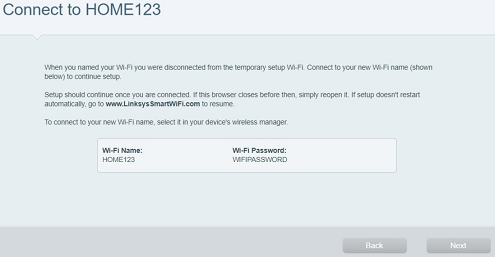 You will be redirected to the Create Your Linksys Smart Wi-Fi Account page. 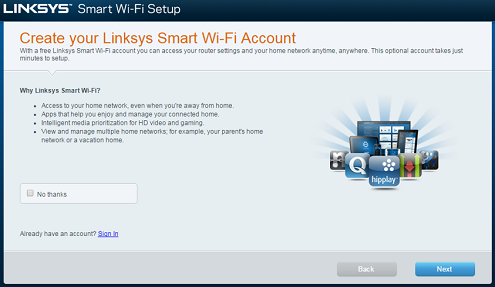 For instructions on how to create a Linksys cloud account, click here. 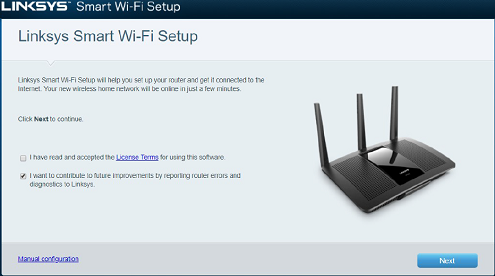 You have now successfully set up your Linksys Smart Wi-Fi Router using the Smart Setup Wizard.